There are several reliable ways to check if an egg is fresh enough to be eaten safely. Most eggs are far from spoiled, even after their best before date has passed. Utopia shows you how to run a simple test for before you enjoy those runny yolks. Is my egg still good? A best before date can be found on each carton of eggs. In many places, the eggs themselves also receive a stamp with the best before date on their shells. This is usually around 28 days from the day they were laid. Even after the best before date has passed, many eggs are still good. Unwashed-eggs last three weeks, even without a refrigerator. They can then be kept in the refrigerator for another week or two. As a precaution, however, you should not eat expired eggs raw or only lightly cooked. There are several methods you can use to determine if older eggs are still good. The water test is probably the best known method to determine if an egg is still edible. Just put the intact, raw egg in a bowl of water. If the egg lays on its side at the bottom, it’s still fresh. If the egg stands upright on the bottom, it should only be eaten when well-heated. If the egg floats to the top, it shouldn’t be eaten. Why does the spoiled egg float on top? From the moment a hen lays an egg, water from the egg yolk begins to pass slowly through the shell and evaporate. An air pocket gradually fills the space vacated by the water. If the egg floats to the surface, you shouldn’t eat it. The egg yolk can also reveal if the egg is still good. 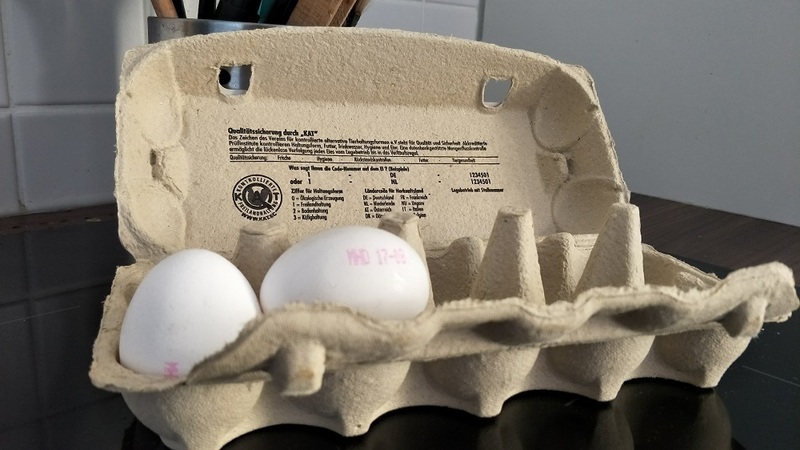 Obviously, this method isn’t suitable for eggs that will be cooked in their shell. But for all raw egg recipes, you can carefully crack open the egg onto a flat surface (it is really important that the surface is not sloped in any way). If the yolk maintains its shape and the egg white stays close by, the egg is still fresh. If the yolk flattens or breaks easily and the egg white spreads across the surface, the egg should be discarded. A cloudy hue to the egg white is a sign of extra freshness, as this “cloudiness” is actually carbon dioxide, which is present when the egg is laid. Over time, the egg white will become more transparent, as the carbon dioxide dissipates. If your egg white is pale and runny like water, you shouldn’t eat the egg. In a quiet environment, hold the egg up to your ear and gently shake it from side to side. If you cannot hear any sound, the egg can be eaten. If you hear a sloshing sound, you shouldn’t eat the egg. This occurs with older eggs because the protein is no longer completely firm. It sloshes back and forth inside the egg when you shake it. Often called “candling”, this is a centuries-old solution. In an otherwise dark environment, hold the egg against up to a strong light. If the air pocket is small and the yolk is only slightly discernible, the egg can be eaten. If the air pocket is larger or the yolk is very visible against the opaque egg white, you shouldn’t eat the egg. As mentioned above, fresh eggs have cloudier egg whites and smaller air pockets. Cloudier egg whites conceal the egg yolks more fully when light passes through. Air pockets continue to grow as eggs age. If a hard-boiled egg does not have a full egg-shaped white when peeled, it was stale when cooked.